He Who Gets Slapped from 1924 is a somewhat lackluster movie, given what one would expect from the combined mad energies of director Victor Sjöström (watch The Phantom Carriage instead) and actor Lon Chaney (watch The Penalty instead). Apart from some refreshing moments, such as the main character’s open delight at the bloody carnage committed by a lion he has let loose (for reasons that would only disappoint you, so better watch West Of Zanzibar instead), it’s stale waters, with a storyline straight out of an impotent teenage revenge fantasy (as in: they’re gonna be sorry once I’m dead), and the clichéd circus setting also doesn’t help (watch The Unknown instead). 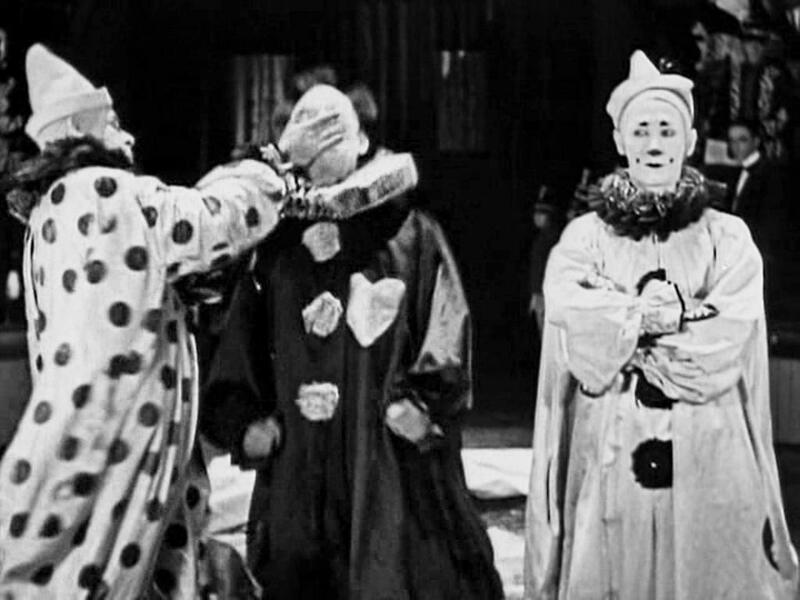 Still, the movie is interesting for the brilliant setpiece it revolves around, a circus performance that deserves a reading separate from the machinations that it motors. Chaney plays a scientist who has made a discovery which will bring him fame and fortune. Unfortunately his presentation at the academy is hijacked by his baron benefactor, who claims the discovery as his own and immediately proceeds to move in with the scientist’s sweetheart. The man barely survives this both emotional and professional shock, and lives on only “to laugh at life.” . . . Years later we meet him in the circus ring, where he is realizing his little scheme for maximum laughter and abjection: “The brilliant scientist had, with a supreme gesture of contempt, made himself a common clown,” a title card informs us. He has designed a lavish production number with tons of allegorical props carried around, which circles around HIM, the clown, receiving as many slaps from his entorage as he possibly can: HE will make commonplace pronouncements about the world being round or flat and receive immediate punishment. As the man is gang-slapped and carried around in mock burial procession, the audience fall over themselves in hysterical laughter. There is a simple correlation between number of slaps received and audience gratification: “Over a hundred slaps last night, HE—you lucky fellow! Soon you’ll be getting famous,” his colleagues cheer him backstage. 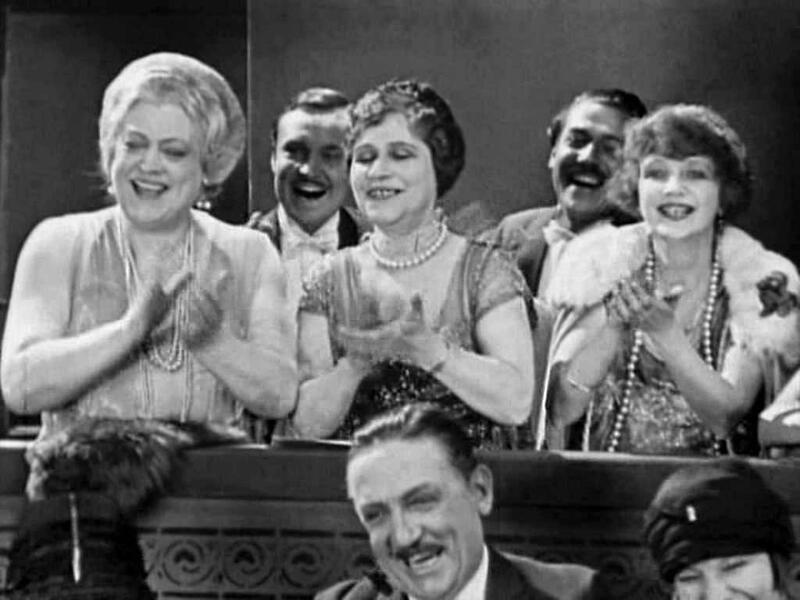 Well it isn’t true, since I don’t laugh, I protest, but of I course know a whole industry of physical comedy was then thriving on the automatized feelgood factor of schadenfreude. So other people laughed, and they still do. It’s a nice touch that the title card is putting the physical slap last, to insinuate that when you have laughed at somebody slipping on a banana peel, you will of course have laughed at somebody taking a spiritual beating. The performance builds on cultural assumptions that are true even if you don’t recognize yourself in their generalized features. You are made to take responsibility for why the others laugh. 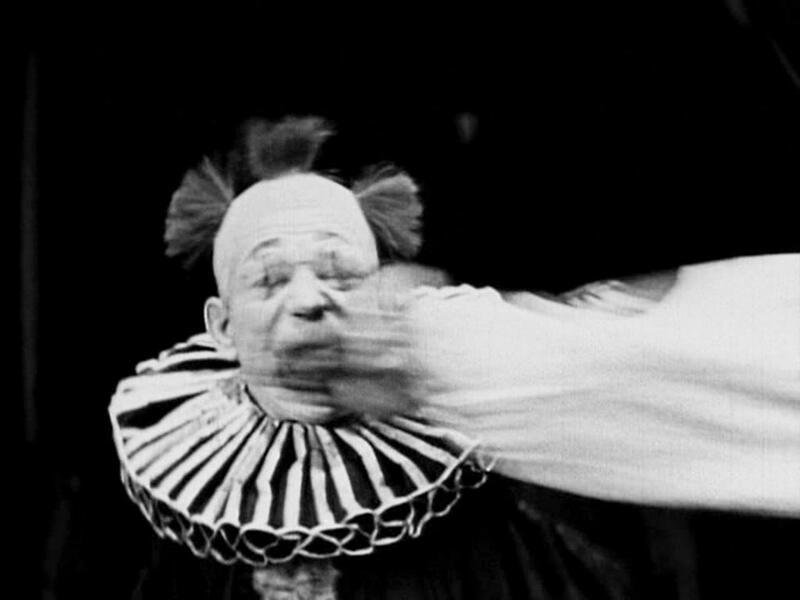 The clown takes each beating with glee, because every slap raises even more violent laughter and thus makes the performance worthier, as if being slapped were somehow a personal achievement, as if the quality of performance and the feedback of an audience under the artist’s control would only in turn provoke the slaps from extras who have been hired to perform that task. Again, shifting responsibilities toward an audience that is given no choice, and stressing the involuntarily participatory nature of this work. In the beginning, the two are almost like a slow kinetic sculpture. Arms are stretched, their weight is made visible, hands are placed on cheeks with great deliberation. 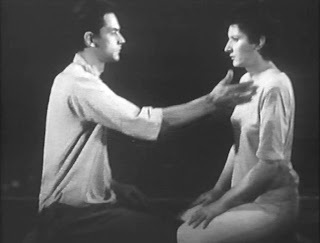 Volume in space, skin over bone, movement against mass. There seems no great psychology involved—here are merely two performance artists taking their craft seriously. 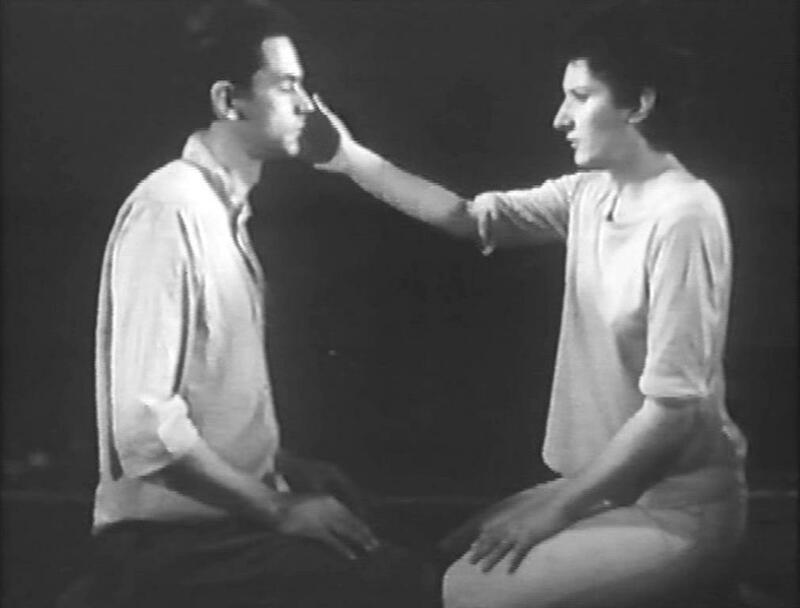 Soon the slapping becomes automatic, and the need for development arises, for a sort of story arc. Thus the slapping accelerates. 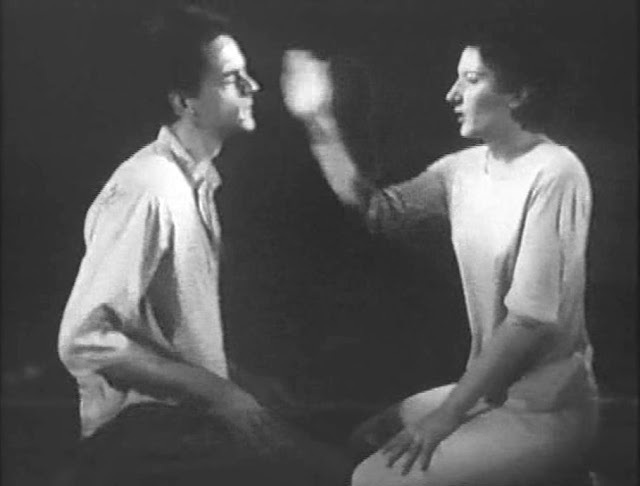 Abramovic sets the pace, she hits quickly, impatiently, to get each slap over with, she doesn’t really hit for effect. Ulay keeps up the deliberation, giving his slaps a little twist from the wrist. He’s obviously the more powerful, the one more into the act. But also, he anticipates each slap he receives, screwing his face up harder and harder in anticipation. He is closer to play-acting, or maybe one could compare him to a guitar soloist making discrete faces. They speed up. Once they’re over a hundred slaps each, this looks like serious work. While the determination doesn’t flag, the steadily but slowly accelerating tempo drags a bit storywise, though. There is no place this can go really. Except of course if real emotion were involved, and they’d start hating each other, or pretending to. But they are too damn professional for that. The slaps get faster and harder, though the arms must ache by now, still the actors/actionists stay neutral. Cheeks are deformed and lazily wobble back into shape. 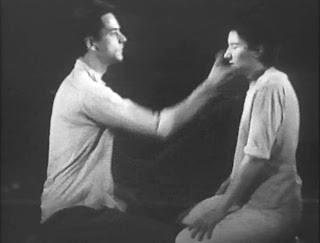 Ulay makes ever sillier faces. 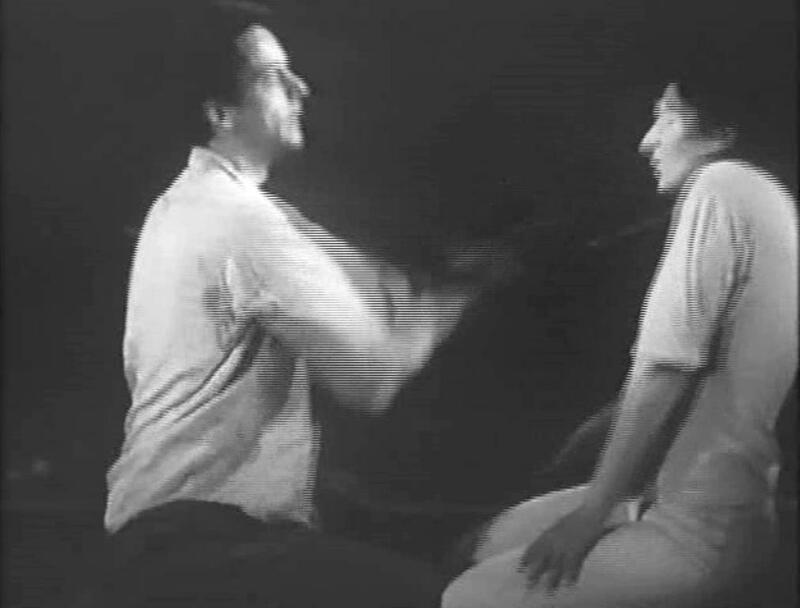 Then he swings, and Abramovic feints, moving her head back, and that’s it. The merest hint of a disappointed expectation of post-coital relief. There is a traditional reading to this, how it is about violence, preferably domestic violence. The male indeed does appear dominant, his slaps have a power that forbid true equality of the sexes. If Abramovic’s reactions wouldn’t be so short-tempered, if she’d put more thought into strategy, things might look better for womanhood—as it is, the man gets way more slapping time. I, the viewer, support all of this, I am again a responsible bystander. And I’m not just part of the narrative, like in the Chaney film, instead my pretenses to being an art connoisseur endorse these acts of violence (and that’s not mere theory, remember the performance where audience members had to save Abramovic from suffocating after she had fainted inside a circle of fire). wrong both when I feel for the woman and when I don’t? I would want to see Ulay cry . . . I cannot work up any emotional involvement, though, these are just reactions my mind tells me I’m supposed to have. Because what I see is still only two professionals who are damn good at doing their work. I see two athletes trying to overcome their physical limitations for the best possible performance. On top of that, their show has a solid theme. Their images translate immediately and with force. The audience reaction is as hardwired as the laughter in He Who Gets Slapped. 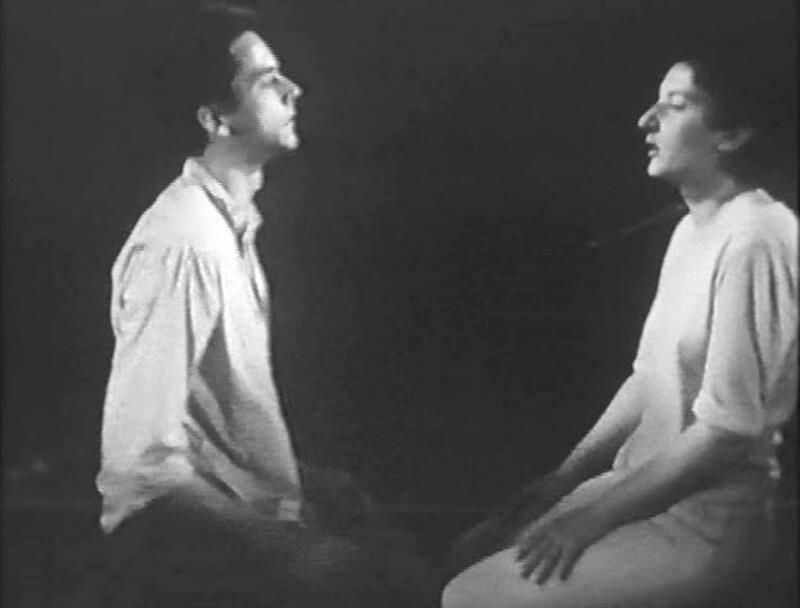 Only, where the film had the fictional audience on the screen react as a postulate of my own behavior, and I was free to react against that, Abramovic and Ulay leave me no freedom except to quit reading their performance figuratively and instead view the abstract effort. And then she dodges a hit, and, though after 20 minutes as a watcher you’re somewhat blunted, you still think: that’s it? No more? The average boxer takes much more. 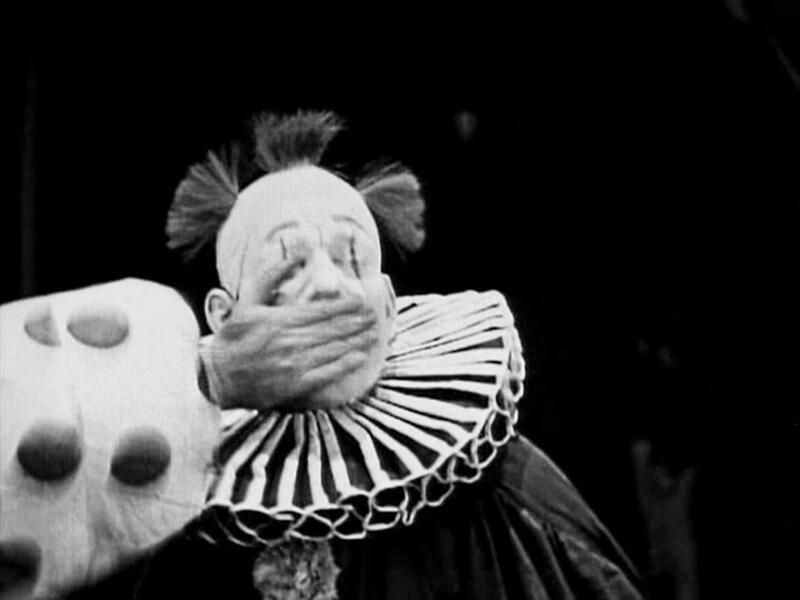 Lon Chaney took much more, he’d been stabbed and stood up dying to take another slap. That was the limit? Pussies. Now if one took that seriously, this would be the most crappy piece of sound art ever. 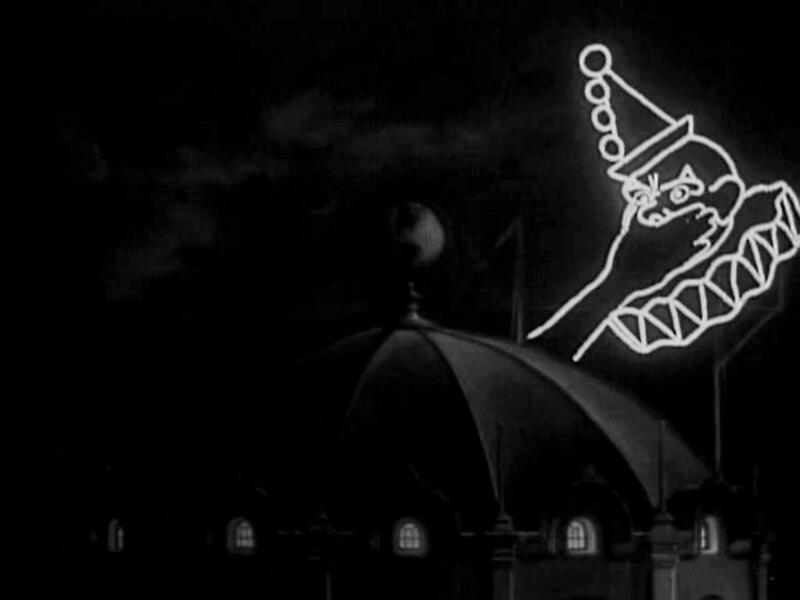 Instead I take it as a permission not to believe in the psychological implications that this performance's iconography seems to suggest. 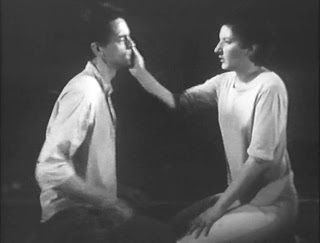 And of course, there's Guy Maddin's 'Sissy Boy Slap-Party': http://vimeo.com/27461762. Oh but that's dreadfully literal, dear.